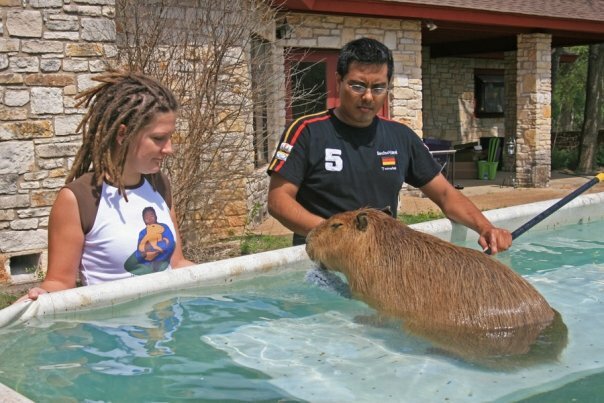 babyJixx was just a baby when Nancy and I met him but, like all capybaras, he grew. Unfortunately, Jinxx did not grow as quickly as he should have due to a series of illnesses as an infant. 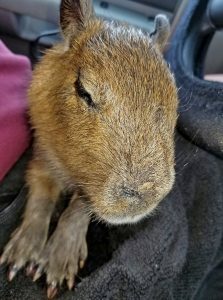 First he had pneumonia, and then diarrhea that took weeks to cure, and finally worms. 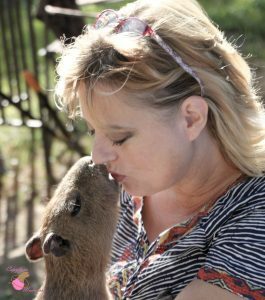 Only Jackie’s persistence, diligence, love, and experience as a human nurse allowed babyJinxx to make it through those first couple of months. Jackie said that babyJinxx loved to go places, especially boating. 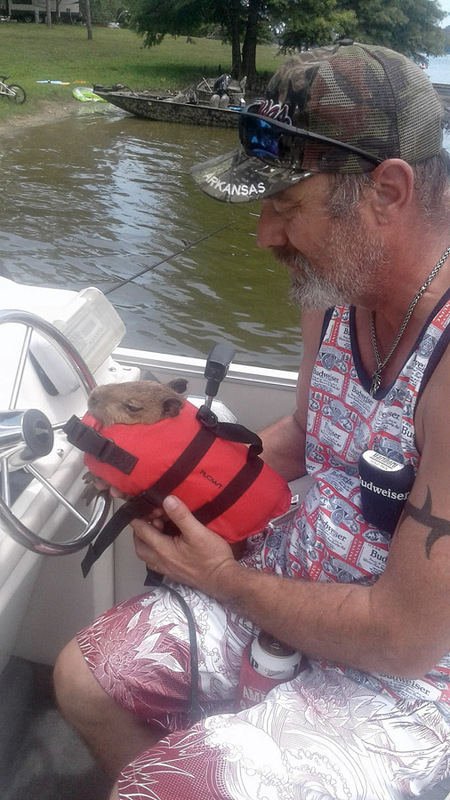 He had his own tiny life jacket (I’ll bet it didn’t fit for long). 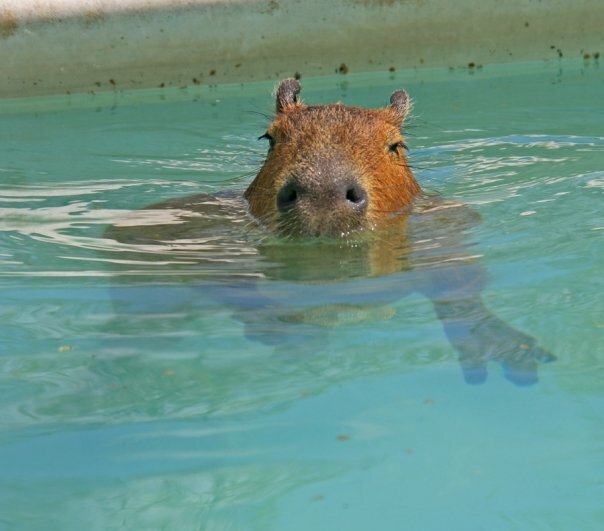 Capybaras are excellent swimmers so it seems a bit overcautious. 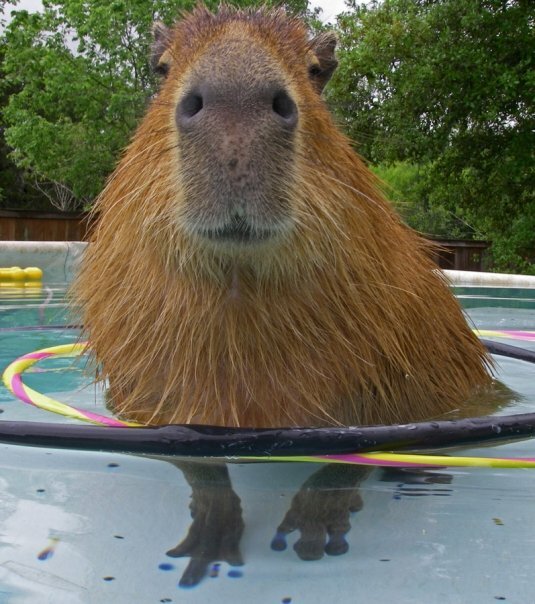 Still, not much cuter than a capy in a life vest. Of course, part of Jinxx’s many travels – to deer camp, the river, school visits, radio and TV interviews – was sleeping during the drives there and back.If only those kids and TV viewers could have seen him sleeping! Love, love, love! 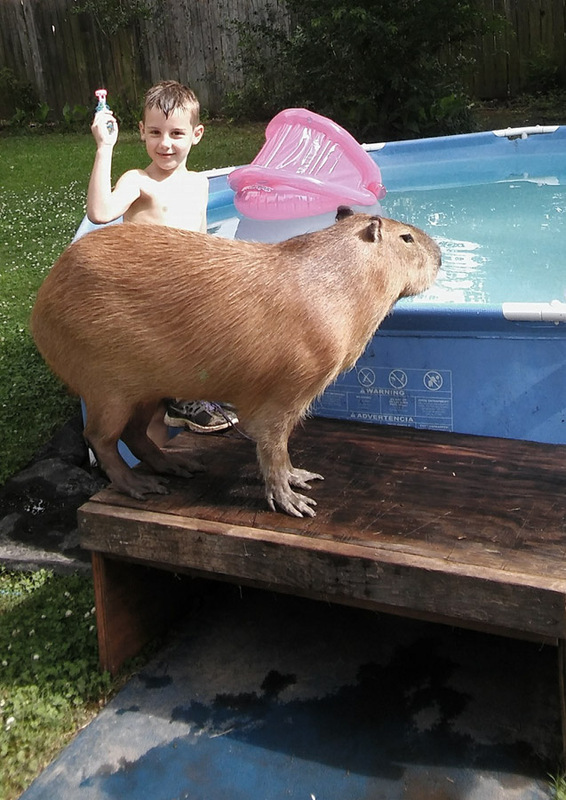 Jinxx was a friendly capybara, always willing to share his pool with a swimming pal. He also got to swim in a lake with his family, something most captive capybaras do not get the chance to do. 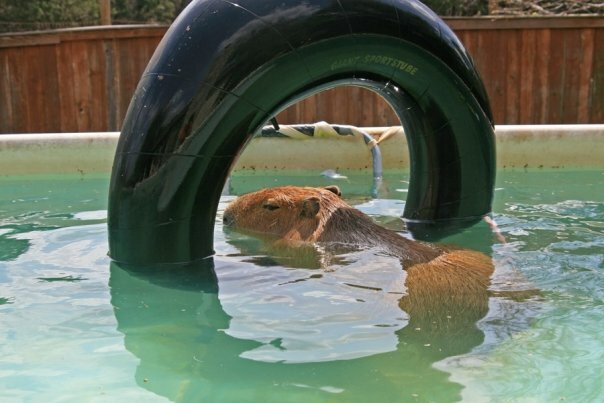 Of course, capybaras like mud as much as they like water! 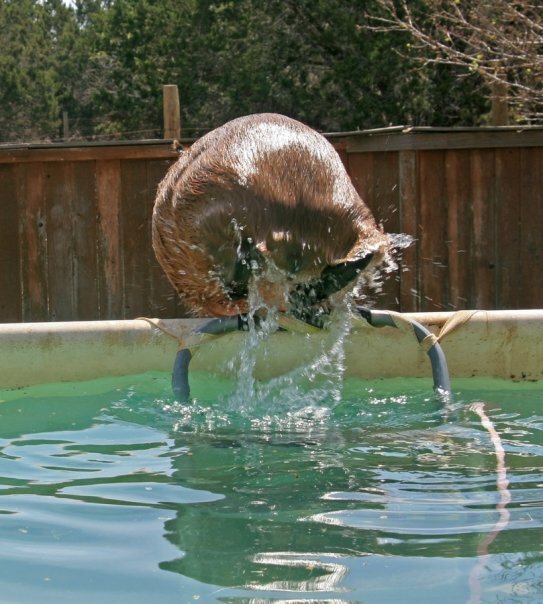 Jackie summarized one of her favorite memories like this: One day I was making him a mud puddle in the back yard. He got so excited that he ran a circle, hit me behind my knees and knocked me in the mud puddle!! What did we do??? My husband came home to find us wrestling in the mud puddle!!! We actually played in it for about 2 hours :). 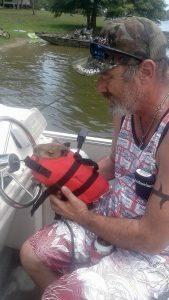 Other favorite memories are of him sleeping between her and her husband, Jeff every night on his own pillow; Jeff singing lullabies and rocking him in the recliner to go to sleep even though he was too big for Jeff’s lap; letting the grandkids hold on to him while they swam and played with him in the pool. babyJinxx will be terribly missed by his family and fans. His sudden death from colic (an obstructed or twisted intestine) has caused tremendous grief and loss. But our memories will keep him alive in our hearts and his photos will bring a smile to our faces. Goodby babyJinxx. I am so sorry you never reached the 170 lbs that Jackie dreamed for you, but you did reach a lot of hearts. No words. I loved him from afar and enjoyed following him on Facebook. Jackie is so precious. Heart sick. Bless you Melanie Typaldos. I am so thankful for meeting you and Nancy Ray when our baby was little. He had a hard battle all of his young life. 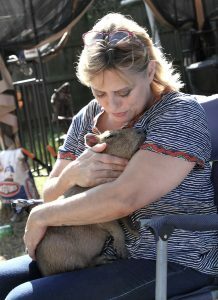 I am forever grateful to you and Stacy Winnick with the R.O.U.S. foundation and Dr. Hoppes at Texas A&M. 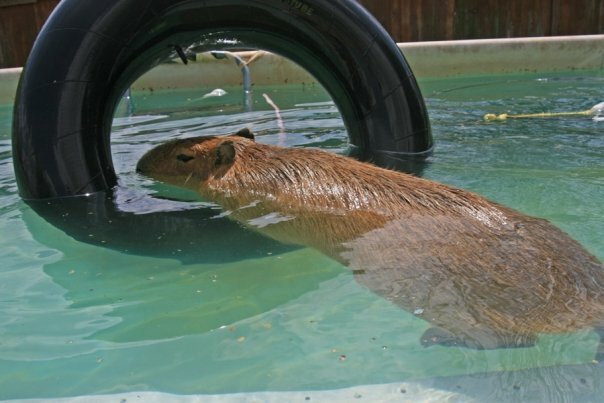 Hopefully someday we will be able to make the world a better place for capybara’s. 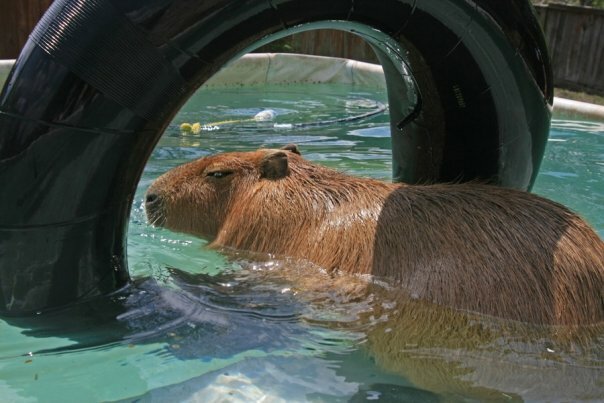 Life is empty without the love and kisses and capy hugs. Our lives have been forever changed. 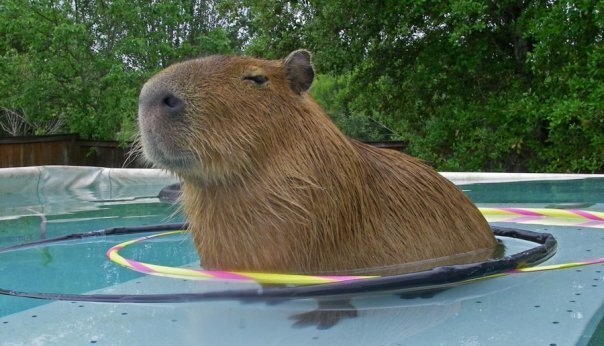 Much love to you and to all that love capybara’s. Jackie Coleman Wren (BabyJinxx capybara’s mom). Well said tribute to Baby Jinxx. My ferrets and I have had the honor of getting to meet such a sweet and wonderful little boy. We are so sad that he is gone and I know Chico will keep an eye on him on the other side of the rainbow bridge. My deepest sympathy to Jackie, Jeff, Jenn and Jay. RIP Baby Jinxx. You Were Greatly Loved By Everyone. Your Short Life Brought so Many People Joy, Love, and Happiness. My Baby Nephew, Just Know You will Always Have a Place in My Heart. Sleep in Peace, Little Baby..
May You and Your Big Brother Chico be there When My Time Comes to Walk Me Thru. You were so very cherished and loved, Baby Jinxx. I love you and will be missing you, too. We will try to take care of your humans for you, until we all meet again. Baby JINX warmed my heart and brought smiles to my face. 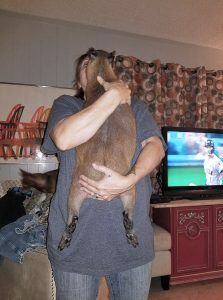 I will never forget BABY Jinx. So very sorry! 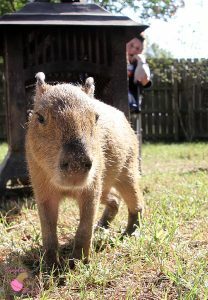 Rest in peace sweet baby!